Peptide (C)GSRDG(S)PEEGGPR, corresponding to amino acid residues 160-172 of rat GFRA4 (Accession Q9EPI2). Extracellular, N-terminus. Homology Rat - 12/13 amino acid residues identical; mouse - 11/13 amino acid residues identical. Specificity Not recommended for human samples. The antibody will recognize both the membrane bound canonical isoform and the putative secreted isoform. Preadsorption Control 2 µg peptide per 1 µg antibody. 1,2. Anti-GFR alpha 4 (extracellular) Antibody (#ANT-024), (1:800). 3,4. Anti-GFR alpha 4 (extracellular) Antibody, preincubated with the control peptide antigen. Immunohistochemical staining of immersion-fixed, free floating rat brain frozen sections using Anti-GFR alpha 4 (extracellular) Antibody (#ANT-024), (1:100). 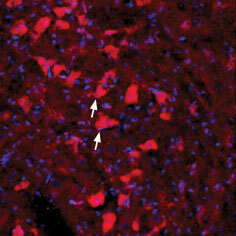 Staining reveals expression of GFRA4 (red) in cells with neuronal outline (arrows point at some examples) in the red nucleus. DAPI is used as the counterstain (blue). Cell surface detection of GFRA4 in live intact rat PC12 pheochromocytoma cells. A. Extracellular staining of cells with Anti-GFR alpha 4 (extracellular) Antibody (#ANT-024), (1:100), followed by goat anti-rabbit-AlexaFluor-594 secondary antibody (red). B. Cell nuclei stained with the cell permeable dye Hoechst 33342 (blue). C. Merge of the two images. Airaksinen, M.S. and Saarma, M. (2002) Nat. Rev. Neurosci. 3, 383. Paratcha, G. and Ledola, F. (2008) Trends Neurosci. 31, 384. Paratcha, G. et al. (2001) Neuron 29, 171. The GDNF family ligands (GFLs) belong to the super family of the TGF-β. They belong to the group of cystine-knot protein and function as homodimers1. This family includes glial cell line-derived neurotrophic factor (GDNF), artemin (ARTN), Neurturin (NRTN) and persephin (PSPN)2. These factors are heavily involved in the development and function of the nervous system (both central and peripheral). In particular GDNF has an important role outside the nervous system where it plays a role in kidney morphogenesis1. In general GFLs all signal through a signal through the receptor tyrosine kinase Ret. Their specificity is implemented by different GDNF family receptor a (GFRα), which act as co-receptors. These extracellular proteins are bound to the plasma membrane via a glycosyl phosphatidyl inositol (GPI) anchor. GFRα1-4 are responsible for the binding of GDNF, NRTN, ARTN, and PSPN respectively and the subsequent activation of Ret. Soluble forms of the receptor by the cleavage of a yet unknown phospholipase or protease can be detected1,3. Also alternative spliced forms of the protein can lead to soluble forms of GFRα receptors3. Alomone Labs is pleased to offer a highly specific antibody directed against an extracellular epitope of rat GDNF receptor α4. Anti-GFR alpha 4 (extracellular) Antibody (#ANT-024) can be used in western blot, immunohistochemistry, immunocytochemistry and live cell imaging applications. It has been designed to recognize GFR α4 from mouse and rat samples. The antibody is not suitable for detecting GFR α4 from human samples.